Irrigated agriculture is growing in Canterbury. This growth has resulted in a greater rush for accessing water resources — surface and ground waters – across the region. Since these water resources are finite, limits on their takes are imposed to conserve them and make them available for other uses. However, setting limits on groundwater has remained a challenge. There are more unknowns than knowns. Does groundwater recharge occur uniformly over a year? Does irrigation add to recharge? How much groundwater could be allocated for irrigation sustainably? To answer these questions, we need to take a closer look at how much water is draining through the ground and recharging the aquifers, as Paul White discussed two weeks ago. In Canterbury, where there is substantial abstraction from groundwater and where groundwater-fed streams and rivers are vitally important, a new initiative has begun to provide some much-needed data. 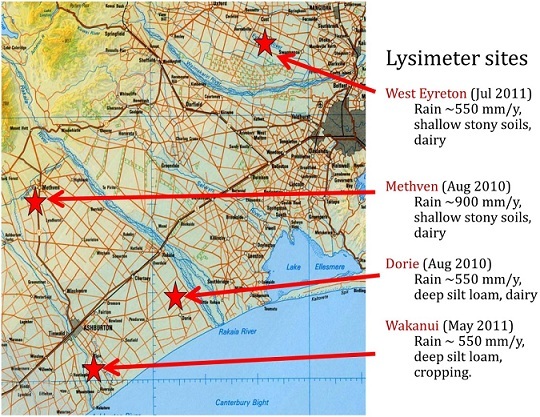 The Canterbury Lysimeter Network (CLN) is a scientific endeavour to identify how much land-based recharge, from rainfall and irrigation, happens across the Canterbury Plains at daily, monthly, seasonal, and annual time scales. The CLN was originally an Environment Canterbury initiative, with NIWA, Aqualinc Research and HydroServices brought in to make it happen. 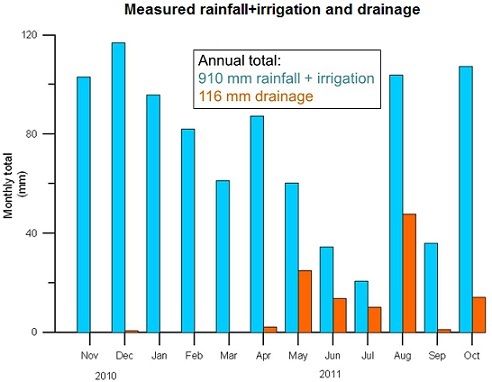 Currently, the CLN has four sites spread across the Canterbury Plains, representing a variety of conditions — foothill vs coastal, high vs low rainfall, well-draining vs poorly-draining soils. All sites are under irrigation. Each site has a set of three drainage lysimeters, and each lysimeter is 700 mm deep and 500 mm in diameter. A drainage lysimeter is a large cylinder, buried vertically in the soil. These lysimeters measure how much water drains through a soil column. The volume of water draining through a lysimeter is a direct expression of recharge of groundwater. The lysimeters are buried with their top at the soil surface. Water that infiltrates through the lysimeters is collected and measured at the bottom. Using these continuously recording lysimeters, we can find out how much water drains towards aquifers and when. 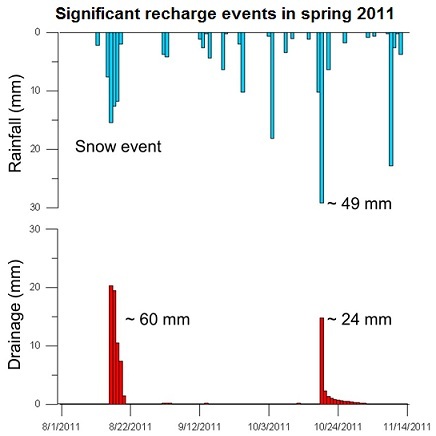 Monthly data from one of the lysimeter sites, below, shows that groundwater recharge is largely occurring in autumn and winter, outside the irrigation season, even if more water falls during the summer. If we look more closely, we can see that it’s the longer or more intense storms that tend to generate large groundwater recharge. What’s next? Our data collection has just started. What we have shown here are preliminary results. We are looking to continue this network over the next few years to quantify precipitation and irrigation recharge over time. Data from this network will also be useful in verifying models of recharge and soil moisture developed by NIWA and others, and allowing better management and allocation of groundwater in Canterbury. Are you measuring the water table as well at these sites? Any data to compare to these graphs?? No, we are not monitoring the water table at any of the lysimeter sites. However, there are many wells in and around these areas where ECan have been monitoring the water table status. Those data are not shown here.